- on the Telemark Canal. The Viking Ship Åsa is a true replica of the Oseberg Viking ship from year 820. While the guests sit on the ship’s chests, a «Viking» lectures about the history of the original ship. The guests may try act as the crew and row the ship. 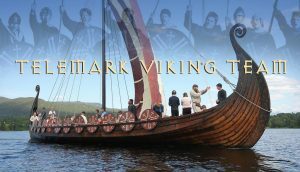 Demonstrations of a Viking battle on the pier, lecture and briefing of Viking weapons and equipment. The ship is owned by the Telemark Viking Team in Akkerhaugen, right next to the Telemark Canal. Akkerhaugen is an area full of history from the Viking Age, including several burial mounds. Historians say that the famous Norwegian Viking King Olav the Holy was born on a farm in this area.